Data visualization augments cognition. Data visualization provides new insights; data visualization teaches the reader. Games, at their core, are all about learning: spatial, temporal, motor, and sometimes even intellectual. You learn how to play within a game's rule-set, and to improve you learn. Once you completely master a game to the core, it ceases to be fun. Once you stop learning, or if you're unable to learn, you play games for reasons other than fun. Data visualization provides a way to aide in the learning process; to keep games fun. If the game is no longer fun, data visualization can also be used to provide other motivators to play. The purpose of data visualizations in games can vary. Some visualizations, like a health bar, exist to show you a character's status. Others, like a technology tree in Age of Empires, exist to show how a character can progress. Even more data visualizations exist not for players - but for observers, such as kill:death ratios and gold count per character in League of Legend game streams on twitch.tv. These are visualizations which provide status information about players or characters, such as: health, score, experience points. The primary goal of status visualizations is enable players to make gameplay decisions (prospective choices) or to give players information on what has happened (retrospective decisions). Sometimes, they do both - as with progress indicators (such as how much experience is left to level up, or what kind of buildings can be built). As in data visualizations outside of games, some choices are better than others. For instance, a bar chart can be pre-attentively processed, meaning that it can understood subconsciously in under ~100 milliseconds. This is an especially important consideration for games. Text must be read before it can be processed, which means it cannot be preattentively processed - which also means it will distract a player, because they have to draw their attention away from the game. 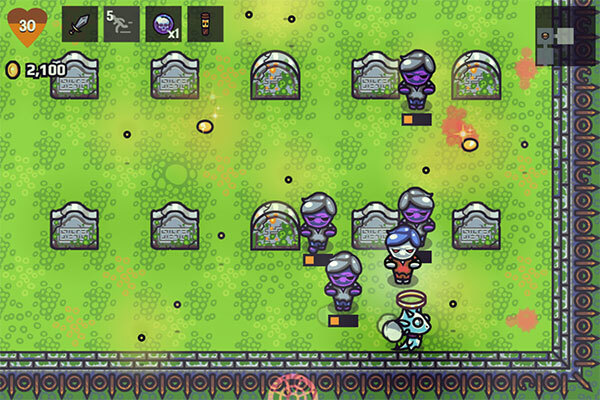 There are multiple status visualizations here: Health (a number and bar chart in the shape of a heart), resource count (money, displayed as a number), current weapon (a dagger in the square next to health), various other items and item counts (other boxes with icons and a number), position on a map (minimap in the top right), and enemy health (bar chart under each enemy). Status visualizations can be targeted at the current person playing the game (e.g., in a single player game), hidden from other players (e.g., information asymmetry in games like Starcraft), or explicitly shown to other players (like in social games, such as in Massively Multi-player Online Role Playing Games - MMORPGs). The kinds of status visualizations and which players can see them (in online games) have massive impacts on the game's design. These visualizations may use status visualizations, but the goal of these visualizations is to improve gameplay. They can be seen by other players, but usually are tailored for the individual player of the game. Charts that show status over time after the game session has ended are an example of training visualizations. However, only a subset of games incorporate these kinds of charts. 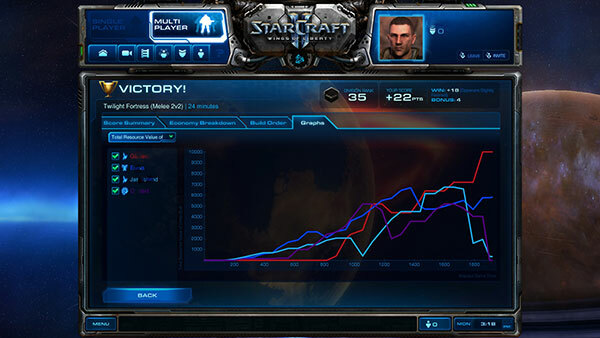 An example of this kind of visualization can be found in Starcraft 2 after a match has ended. After each game, various graphs are presented which show how the game progressed for each player over time for various dimensions, such as army size and economy. Many skill-based games like Starcraft or League of Legends also capture all gameplay and allow you to watch it as a replay. By watching replays, like in sports, players can see where their gameplay broke down and make better decisions next time. More skilled players will often upload game replays to allow others to learn from them; some people, like Day9, even provide extensive replay analysis. Different genres of games have different goals, which influence the kinds of visualizations they provide. While they may have different objectives, they use a combination of status and training visualization types to accomplish their aims. First Person Shooters (FPS) and Real Time Strategy (RTS) games are largely skill based; inherently driven by improving one's gameplay. If you play Starcraft (a RTS) and you constantly die, it's not very fun. Likewise, if you never die, it's not very fun. A delicate balance exists between skill and difficulty. In these kinds of games, an abundant amount of training visualizations exist to help you improve your gameplay. Like chess, progress is all internal to the player of the game. Like chess, these games are based solely on skill: the only advantage you have in the game is your ability to play it. Each game session is self contained, and pits your skill against another player's skills. If your gameplay is not improving, you are not learning, your skill is not increasing, and you cease having fun and stop playing. All games, including skill-based games, use some forms of status visualizations. The way they are used varies amongst genres. Skill-based games use status visualizations to assist your gameplay decisions, but can only provide assistance. The "Fog of War" is a visualization in RTS and other similar games that allows you to only see what your units can see. You are prevented from seeing the enemy's information, and this information asymmetry is a key part of a game's design. The player must make the decision to scout or to attack blindly. And, even if you do have information of the enemy base, often times the enemy will have units hidden elsewhere; or, they might be baiting you in. Even if you had "perfect information", there is the additional layer of the enemy's skill in maneuvering their units, or in how well the enemy can micro-manage their army. With these games, visualizations alone play small roles in the in-game decision making process. In Everquest 2, enemies are colored by difficultly. Yellow means the fight will likely be tough. Just having a single piece of information about the strength of the enemy will inform your decision to attack them. If an enemy "cons" green, for instance, it means the fight will be trivial. In these games, the data visualization is the main driving force behind the decision making process. Depending on the genre, some kinds of data visualizations are more useful than others. As a very broad statement, skill-based games rely largely on training visualizations to improve a player's skill to help the player make decisions for future games. Social oriented games rely more on status visualizations to aide more in decision making as it happens, and have fewer training visualization types. Many games use visualizations that are, in a sense, "outside" of the game itself. Their purpose is largely to motivate you to keep playing. Nearly all online games use some sort of data visualization to provide social motivation, such as custom appearance options, which has little impact on gameplay. One example of a social motivator that has little to do with actual game data is your equipment's appearance in games like World of Warcraft or Everquest 2. In these games, the appearance of your equipment can be customized. This divorces the visual appearance to the actual equipment data, making the visualization nearly meaningless in the context of knowing what the "stats" of the equipment are. However, the visual appearance of your character is a social expression, and some players are often motivated to obtain visually distinguishable equipment as a way to communicate social status. 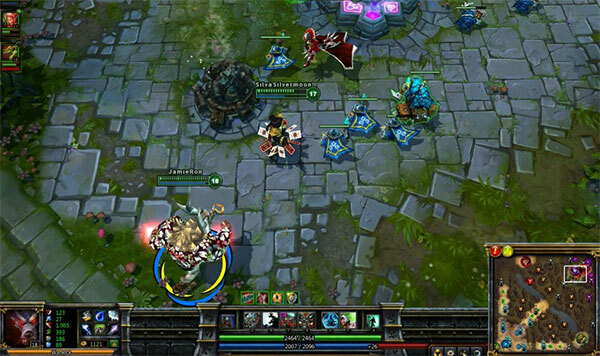 Other games, such as League of Legends, also makes use of social motivators. In League of Legends, you can purchase custom "skins" for your character which have no impact on gameplay. However, custom skins act as a social status symbol to other players. Your kill:death record is also public, and some players may be motivated to play to increase their total games won, or their rank in the ladder / tournament system. Most games these days include some sort of achievement system. Achievements act as visible indicators of progress. If these are public, they can also act as social motivators. If the game is fun and enjoyable, achievements can enhance gameplay. If the game has ceased to be fun, however, achievements can act as ways to keep otherwise unengaged players motivated to keep playing. Most games largely use Non-Diegetic interfaces. A non-diegetic interface is one that exists outside of the game world; it exists only for the player of the game, not the characters inside the game. For many games, like League of Legends, data visualizations don't distract much from the game. Seeing a player's health bar, or the minimap, or the fog of war, does not ruin immersion. For some genres, like Multiplayer Online Battle Arena (MOBA) or Real Time Strategy games, this kind of information is critical. This kind of interface is called a "non-diegetic" interface. This means the interface exists outside of the game world; the interface exists for the player of the game - not the characters inside the game world. With nice aesthetic design (like the organic insect-like user interface in Starcraft for the Zerg race), non-deigetic interfaces do not necessarily ruin immersion, or make the player feel like they are not in the game. Designing visualizations for non-diegetic interfaces is a bit easier, as the visualizations need only to be interpreted by the player. Diegetic interfaces, on the other hand, are interfaces that exist inside the game world. These are interfaces that must make sense both for the characters in the world and the player of the game. Diegetic interfaces help make a game more immersive. If a health bar and ammunition count are displayed in a non-diegetic way, stuck at the top or bottom of the screen, it can be distracting. Anything distracts the player is usually a bad thing; especially when you're exploring an abandoned spaceship and shooting space zombies. Deadspace is a game where nearly all interface components and visualizations are diegetic. 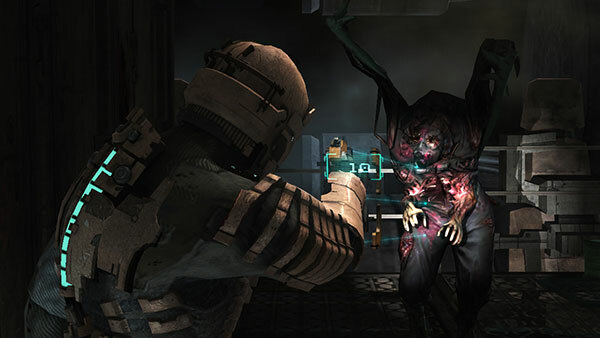 In this screenshot of Deadspace, there are at least three obvious pieces of data being visualized - and they all exist both in the game world and for the player. First, the health bar. In Deadspace, your character's health is represented as cyan colored bars on the back of the in-game character (near the bottom left of the screen). Health is a status usually indicated by a bar chart; in Deadspace it's still essentially a bar chart but it's actually on the character in game. Second, your weapon's ammunition count. Your gun has a sort of heads-up display with the amount of ammo left. It looks static in the screenshot, but that display actually exists in the game world, and moves around with the character. Both you and the character see the ammo displayed. Third, the targeting lines. In games like Counterstrike or Call of Duty, a crosshair is usually used to indicate where your bullet will go. A crosshair is a non-diegetic interface component - the player in the world cannot see the crosshair; only you can. In Deadspace, there is no crosshair. Instead, you see a laser indicating where your bullets will fly. Both you and the character see these laser lines. Visualizations in games need not feel "tacked on." They can be subtle. When playing Deadspace, my "health bar" does not feel like an explicit data visualization. The diegetic visualization of a health bar makes me feel as if it's giving me information without having to look at it. It creates more of an emotional reaction than an intellectual one. With traditional visualizations, you know you're being given information. Bar charts and pie charts explicitly tell you a story about the data. There exists a great potential for games to contain data visualizations which inform the player in subtle ways. Visualizations which feel like they are part of the world - which may not even feel like visualizations at all - can be far more powerful for creating experiences. Games have as much potential as any form of art, and possibly even more potential, to create powerful experiences. Writing, cinema, music, and painting all create experiences in the participant's mind. Like movies, games can include all other art forms (including games inside of games - 'minigames'), which can be used together to create novel experiences. Unlike other art forms, games are inherently interactive. With that interactivity comes a bigger potential for creating perhaps more powerful experiences, or having experiences emerge that the designers never intended. Of course, video games are relatively young. While there is much talk about how games are evolving as an art form, there seems to be far fewer people talking about how data visualization fits into game design. Not only am I excited about how games will progress as an art form; I am excited by how games can better incorporate (and even move forward) the field of data visualization. 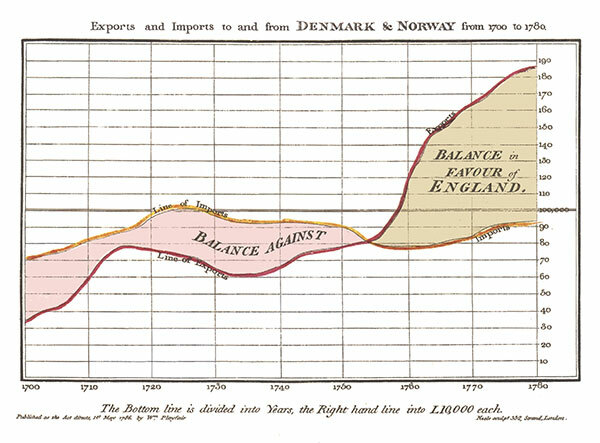 William Playfair was the founder of graphical methods of statistics - inventing the line and bar charts in 1786. Since then, we've seen a lot of novel data visualizations, such as Charles Minard's flow map of Napolean's Russian Campaign. Computers increase the potential of what data visualizations can be, and tools like D3 are increasing the number of people make data visualizations. I think games have the potential to allow for novel visualizations and novel ways of combining existing chart types (like how Minard's flow map so eloquently used multiple visualization types). Not only can data visualization improve the player's gameplay and aide in decision making, it can be used to more fully immerse the player in the game's universe. Games, I believe, not only make possible new visualizations; but visualizations can make possible better games. 2096 subscribers. The only emails you'll ever see from me are when I publish a new article.